When one of my sons applied to college, I learned that even if I've saved enough to pay for tuition and related expenses, a college-bound child is still eligible for a federal student loan. Federal Direct Unsubsidized Loans are available to students regardless of financial need. Rather than cash out investments to pay all of our college bills, my child may decide to take a student loan to cover extra expenses associated with attending an out-of-state university. But before accepting the loan, it makes sense to review the costs of borrowing. As the parent of children attending college, I have been urged to complete FAFSA (Free Application for Federal Student Aid). The purpose of this application is to enable colleges and universities to develop a financial aid package for students based on income and assets of the family. By completing FAFSA, I can determine my Expected Family Contribution (EFC) compared to the Cost of Attendance (COA) for a particular college. Any shortfall can then be awarded in financial aid, which may include grants, scholarships, work-study arrangements, and loans. What I have heard repeatedly is that parents should always complete a FAFSA because they will be uniformly surprised at the money available to them. When my oldest son enrolled in a public university in our state, I played with FAFSA calculators and determined that we would not be eligible for financial aid and skipped the application process. With a second child getting ready to attend college in the fall, I decided to complete the FAFSA for a few reasons: 1) he is interested in attending an out-of-state public university with higher costs than in-state choices; 2) with two students in college, we may now qualify for financial aid; and 3) scholarship opportunities require a completed FAFSA (even merit-based ones, I'm told). Still, I was skeptical and as I predicted, our EFC exceeds the estimated COA. Interestingly, though, I have learned both from my completion of the form online and financial aid letters, that my son qualifies for an unsubsidized loan of $5,500 yearly. Judging from the reaction of parents on a private Facebook group set up by the admissions office of a prominent university, there is some confusion about what such a student loan involves and how a loan fits within the offered package. Further, as odd as this statement may sound, it seems that some students may not be aware that they will need to pay back student loans awarded as part of financial aid packages. So, I thought I would figure out exactly how much the unsubsidized loans could cost students who borrow for four years, presumably the amount of time required to complete a college degree. Next, figure the loan balance at the end of each year prior to graduation. I'll need the following information for this calculation: 1) loan balance; 2) interest rate; 3) how interest is applied and compounded (daily, weekly, monthly, or yearly); and 4) whether the interest accrues or is capitalized. According to FedLoan Servicing, interest accrues daily. Further, I am going to assume an annual loan amount of $5,500, annual interest rate of 4.66%, and capitalization of interest to the loan balance (rather than payoff of the interest while the student is in school). Using the Future Value (FV) function in Excel, I can determine that the future value of the loan balance after the first year in college will be $5,762.35. The formula looks like this: =FV (4.66%/365, 365, 0, -5500, 0). To pinpoint the interest charges, subtract the beginning loan balance from the end-of-year balance ($5,762.35 -$5,500.00 = $262.35). By the end of four years, a college student has received $21,763.94 in cash, paid $236.06 in origination fees (taken out of loan disbursements), and accumulated an additional loan balance of $2,751.64 because of interest. The graduate now has a degree and $24,751.64 in student loans. If the grad decides to pay back the loan over 10 years, the monthly payment will be $258.44. Determine the loan payment using this payment estimator or the payment (PMT) function in Excel. Over the life of the loan, the borrower will pay $31,012.24 in total, or $9,484.36 in interest and fees. Note that the interest rate and origination fee may change during four years (or more) of college. Again, Federal Direct Unsubsidized Loans are available to students regardless of financial need. 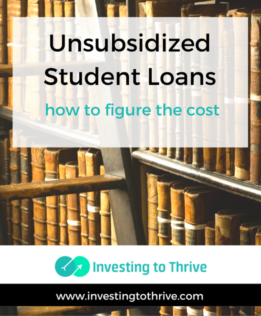 Subsidized loans are available based on demonstrated financial need. Both loans have the same interest rate and origination fee, though the rates and fees may vary depending on when loans are taken and money disbursed to students. The biggest difference between the subsidized loans and unsubsidized loans is that the U.S. Department of Education pays interest on subsidized loans while the student attends college (at least part-time), during a grace period after graduation, and during eligible deferments. If a student's parents have significant investments held in non-retirement accounts and/or have relatively high income, a family may not be eligible for subsidized loans, work-study programs, or need-based scholarships. But all families should qualify for unsubsidized loans. Students and their parents may consider the cost of borrowing (and the opportunity cost of cashing out investments) to decide whether they'll accept these loans to pay for college.